The battle for the presidency between Greeley and incumbent Ulysses S. Grant is portrayed here in biblical terms. 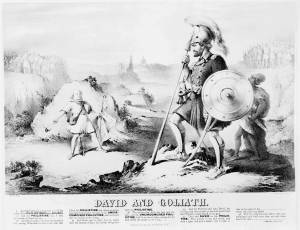 In a mountainous desert landscape Greeley, as David armed with a slingshot loaded with quill and inkwell and grasping a copy of his newspaper the New York "Tribune," confronts a giant Grant. The latter wields a lance, a sword, and a shield. In his shadow stands a black youth attendant.